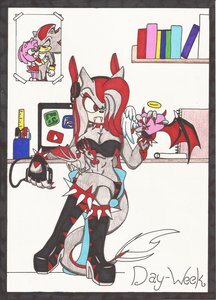 As you guys already know I'm a ShadAmy fangirl and will mostly draw them. Here is where I post my 18+ rated artwork since DeviantART doesn't support high adult content on their site. Don't ask me for commissions, requests, art trades, etc. I practice in the mature field to expand my artistic talent. Feel free to private message me if you wish to chat. Thanks for the fave, and nice icon btw!